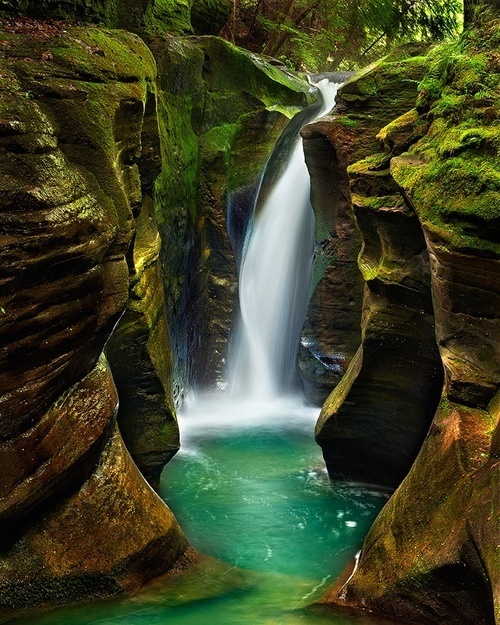 The Hocking Hills is a deeply dissected area of the Allegheny Plateau in Ohio, primarily in Hocking County, that features cliffs, gorges, rock shelters, and waterfalls. The relatively extreme topography in this area is due to the Blackhand Sandstone (so named because of Native American graphics on the formation near Newark, Ohio), a particular formation that is thick, hard and weather-resistant, and so forms high cliffs and narrow, deep gorges. I live in Ohio....not far from Hocking Hills and go there regularly. My husband grew up here and we have never even HEARD of this place.... I am going to search for it and when I find it, I will post where it is! Same here. I've lived around that area and frequented old mans cave most of my life, and I've never heard of it either. Oh! I know that place now! It's locally known as paradise lost. I've swam and camped there many times. This falls is on private property. I am a member of the family who owns part of it. We WILL prosecute trespassers (Yes, we are tired of the mess). It is NOT in the State Park. Do not violate the laws, please. Besides, the photo, while beautiful, misrepresents the falls, which is no taller than 7′ high at best. Water does not always fall over the rock formation. Your visit will be disappointing and illegal. Perhaps if you persist in inviting people to our property, you would like to contribute to our increased liability insurance ? Not kidding. I totally agree with Kim Brown!!! People do not understand that the owners have to buy liability insurance to keep them from being sued by idiots who visit the land, hurt themselves and sue! Also, they must pay property taxes as well...so stay away!!!! You can't visit this place? Hey Willy, Do you know if that water is deep enough to jump off the cliffs? That's my sport and I would love to fly off those gorgeous cliffs! No, one can't dive off theses walls the photo is very deceiving .The falls are only 6-7 ft tall and it lies at the end of a gorge on private property. Also as described this is not an example of blackhand sandstone. Those walls are over 100-150 ft in height and make up the larger hollows surrounding the Hocking Hills. The area described in Newark is along the Licking River and is less picturesque. This particular falls is a local phenomenon and is representative of the geology of the area that is not state land. It is not on the "list" of attractions to the Hocking Hills State Park.. . . I am heading to this area on Wednesday and really, really want to do some photography at this spot! I know that if it is navigable water I can legally be there, but the definition seems to be pretty vague. Since you are familiar with the spot do you have any idea how to contact the landowner? Were you able to find it??? I found it easily and it can be reached without crossing any area posted. The signs and fenced off area are on the east side of the stream opposite of the trail leading down there. I was a little disappointed to find fallen trees in and above the waterfall but I still took a few shots while I was there. I shot it fairly wide so as not to accentuate the fallen trees. These falls are located at St Rt 664 and Zwickle. As a child my boyfriend played and swam in this water. Back then it was owned by a member of his family. Thanks for the picture, it brought back fond memories to him of his youth. wish it still was own by his family... they might do the right thing and not put up signs... Landownership!! To Marc Schultz: Amazing pictures!!! So impressive! I want to go there for Memorial Day...Is there any way you could contact me , I would really appreciate that. My email: anialapinska@o2.pl. Thanks a lot! To Mark Schultz. Your photography is fantastic! I'm very happy I was curious & entered your link. Love the Michigan shots...been living here since '95. The place you shot in OH was awe inspiring as well. Cleaning up trash... Respectable photographers/hikers would never leave trash. Why are you punishing the world for what one or two probably kids are doing? This is private property! What don't you get about these people having liability and paying the property tax you darn democrat! "road trips" on Facebook just posted this location on July 3rd. Just wanted to share this (thought it might help):: http://www.nationalrivers.org/us-law-who-owns.htm -- provides detailed information about federal waterway laws. I can understand why the owners would be upset with litter! However, not everyone is disrespectful to the beauty of nature or to others. I was hoping my fiance and I could visit here; we love adventures, especially with hiking, fishing, and rafting. The legal concepts associated with your post are associated with the federal government's ownership of navigable waters. Under no circumstance would the stream pictured above be considered navigable. Rather than attempting to put together a feeble legal rationale, why not actually do the right thing, which would be to respectfully request the landowner's permission to access their land. Generally people are quite amenable when treated with respect. Even gas companies and land agents have the decency to do that. Yeah, there are No Trespassing signs along the road. If you decide to go anyway, 'Leave No Trace'. There are no trespassing signs down one side of the fall. However, there is a gravel pull off on the other side of the rd. for it and only the other side is marked. I assume this side is the states property. It was a slight downhill trek. If you go don't leave trash, and clean up any you find please! They are seriously tired of the trash, there is barbed wire on their side. It is beautiful, please don't ruin it for all of us by littering! Yes there is one sign by the guardrail but I believe they only own the other side. That's why there is no wire or other sign on this side. Can someone post the gps coordinates to the spot where you are aloud to park and hike to the falls? Thanks! Does anyone know if this is pet friendly? Not necessarily if pets are allowed but if the hike is easy enough for my dog? I have been going here for years it was a tightly kept secret, guess not now:-(. It is state land outside the fence line but please keep your trash we don't want it. Easy to find if you know where to look. This site is on private property and is not associated with Hocking Hills State Park. These falls are not accessible from any public land. Trespassers can and will be prosecuted. As much as I would love to explore this, I agree with Kim and we should respect the law and her wishes. I've hiked over 300 miles in the park and we should all do our best to help pick up trash and prevent graffiti as the park is understaffed and underfunded. It is slowly being destroyed by over crowding and the many people that don't respect the rules. I created a music slide show with my Puppy and gave a link to my blog. I am sorry that the property you choose to own has an interesting thing on it that has quite likely existed for thousands of years before someone threw and/or murdered the Indians off of it and then sold it to you. That must be very difficult for you. And those Indians threw and/or murdered a previous group of Indians, and so on, and so on... What is your point, and how does it possibly rationalize disrespecting another person's property? Anyone have GPS coordinates to this place? How long of a hike is it to the falls? mua hàng mỹ có đảm không? mua hàng mỹ có tốt không? mua hàng mỹ ở đâu? I LOVE it here! It is the most beautiful place I have EVER been! The amount of trash did NOT disappoint me. I was able to fill three bags with mush trash still scattered along the ground. I would SO go back. I understand this is ILLEGAL, but that won’t stop me.